Large data centers have uncompromising needs for performance, uptime and scalability. High end security gateway solutions must perform network access control within the unique requirements of these environments-ultra-high throughput, connection capacity, session and logging rate-while supporting the latest networking standards like IPv6. With the increase in sophisticated attacks, additional security layers such as IPS, Application Control, URL Filtering, Antivirus and others are also required. In addition to their vast performance and security needs, data center environments are characterized by rigid requirements for high reliability of its various systems. All of these requirements drive the need for redundant, serviceable and highly available components and systems. The Check Point 41000 and 61000 Security Systems are built for these demanding environments and are based on proven technologies used by Fortune 100 companies and telecommunication vendors all over the world. The Check Point Firewall, IPS, Application Control and Identity Awareness technologies have been awarded the highest 3rd-party certifications possible including NATO Information Product Catalog; US Government penetration testing; Department of Defense Information Systems Agency, ISO-IEC 15408 and more. These two platforms improve security, protect business continuity and reduce operational costs in complex, mission critical security environments such as data centers, Managed Service Providers and telecommunication companies. By adding more SGMs companies get more security and performance. Because SGMs are hot-swappable, customers can add SGMs, boosting performance to new or existing 41000 and 61000 systems even when those systems are in production. The 41000 and 61000 Security Systems employ a highly flexible and modular system architecture that significantly boosts security and performance. Each 41000 and 61000 Security System is packaged with a group of preselected Check Point Software Blades-including Firewall, IPsec VPN, Identity Awareness, Advanced Networking, and Acceleration and Clustering. Additional Software Blade upgrades are available to further extend and customize protection options. Full integration into the modular Software Blade Architecture allows for rapid and easy activation on any Check Point security gateway and to provide integrated and comprehensive protection. The Check Point 41000 and 61000 Security Systems meet the stringent operating conditions required by telecommunications companies. 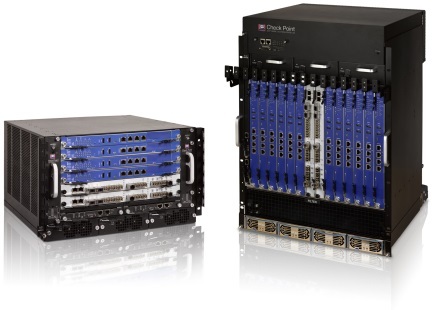 Download the Check Point 41000 Appliance Datasheet (PDF).